It has become commonplace to hear complaints about the United States Postal Service; specifically concerning their slow delivery, high prices, poor service, and lost or misdelivered mail. Economists frequently tell us about the inherent problems with any service controlled by a monopoly. 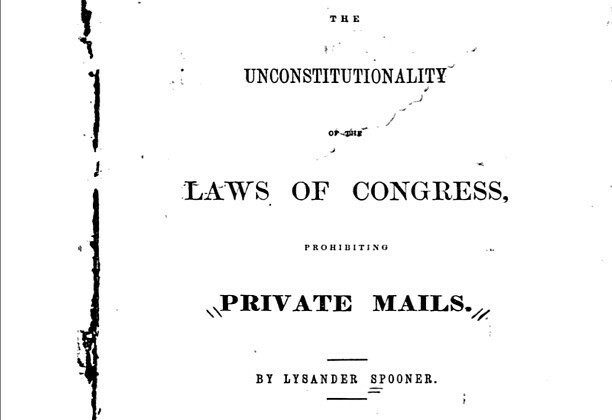 How many of us are aware that the strongest possible case against the USPS and the monopoly they enjoy was made over 260 years ago by a political philosopher and legal theorist named Lysander Spooner? The conflict arose when, in 1844, Spooner founded the American Letter Mail Company which, while commercially successful, was a direct challenge to the USPS monopoly. The government challenged his right to compete with them in court, and exhausted his financial resources in the process, forcing him to close the business without fully litigating his case. He did, however, publish a pamphlet that same year, laying out his case against the monopoly. 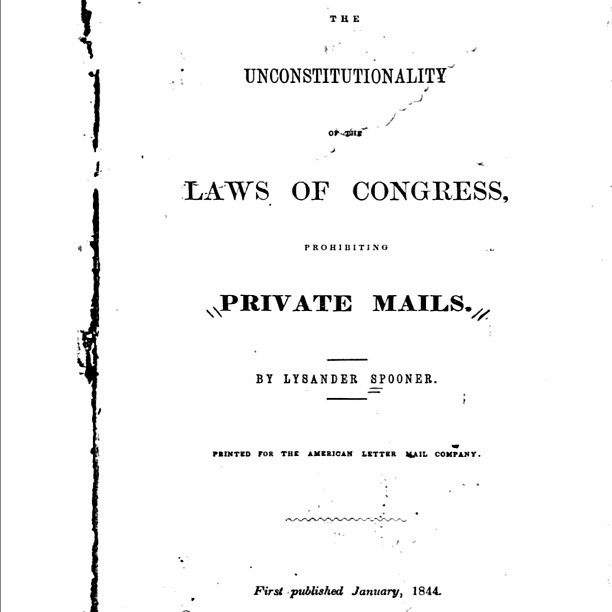 The pamphlet, titled “The Unconstitutionality of the Laws of Congress Prohibiting Private Mails”, is still readily available. With devastating force of logic, Spooner presented a case that is, to this day, both directly relevant and unanswerable legally, constitutionally, or philosophically. He presented his case in three parts; the argument which lays out 28 propositions, a review of the Postmaster General’s argument (rebutted point by point), and his rebuttal to the question of expediency. Spooner’s case may be summarized as arguing several main ideas. First, that all laws prohibiting private mails are unconstitutional: The (Article 1, Section 8) granting of “power to establish post offices and post roads” does not express or imply any surrender of individual rights, or any prohibition of competition on the part of private individuals. It is simply a grant of the power to engage in the specified power.